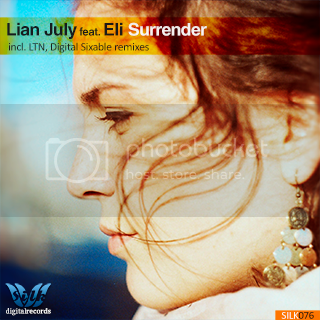 To kick off 2014, we proudly welcome Israeli DJ-producer Lian July and Canadian vocal talent Eli to our parent label with the deep and sensual "Surrender". On remix detail, we're thrilled to welcome back global phenom LTN, whose consistently visionary work has appeared across countless Progressive & Trance radio playlists of late, as well talented label veteran Digital Sixable, whose own contributions last year proved to be some of the highlights of our catalogue. The Original Mix kicks off with an energetic rhythm and deep bassline, as Eli, singing in a beautiful tenor, delivers the opening verse. Hypnotic, swirling pads offer great "dimension" to the soundscape, while various other flourishes are provided by additional synth layers, including a repeating organ motif. The groove continues to subtly crescendo throughout the track, and the titular vocal "hook" offers a gorgeous climax. LTN contributes a pair of stunning remixes; both vocal and dub versions are included in the pack. A much deeper, "late-night" affair, his interpretation kicks off with a moody aura, as a variety of noir-influenced jazzy stabs build anticipatory suspense, leading up to the main break. Eli's soulful lyrics and emotive delivery are powerfully felt, as the more minimalist groove really allows the vocal to breathe. The instrumentation continues to pick up steam, as a guitar riff and crystalline, bell-tinged effects add wonderful melodic texture to the already lush soundscape. Finally, rounding out the package, American sensation Digital Sixable offers a poignant 'Dub" take. A dark, after-hours groove sets the stage for a contemplative and soothing interpretation. The main melodic themes of the original have been beautifully re-worked on the piano; moving string effects reinforce the emotional impact.